10 A None No Power Seat 10 A is a standard UK Domestic seat that has extra legroom however, there is no window-side armrest which may be bothersome. 10 B None No Power Seat 10 B is a standard UK Domestic seat that has extra legroom due to the exit. 10 C None No Power Seat 10 C is a standard UK Domestic seat that has extra legroom due to the exit. 10 D None No Power Seat 10 D is a standard UK Domestic seat that has extra legroom due to the exit. 10 E None No Power Seat 10 E is a standard UK Domestic seat that has extra legroom due to the exit. 10 F None No Power Seat 10 F is a standard UK Domestic seat that has extra legroom however, there is no window-side armrest which may be bothersome. 23 D None No Power Seat 23 D is a standard UK Domestic seat that may have slightly limited recline. The proximity to the lavatory may be bothersome. 23 E None No Power Seat 23 E is a standard UK Domestic seat that may have slightly limited recline. The proximity to the lavatory may be bothersome. 23 F None No Power Seat 23 F is a standard UK Domestic seat that may have slightly limited recline. The proximity to the lavatory may be bothersome. 24 C None No Power Seat 24 C is a standard UK Domestic seat however, other flyers tend to bump into this seat. The proximity to the lavatory may be bothersome. 25 A None No Power Seat 25 A is a standard UK Domestic seat however, the proximity to the lavatory and galley may be bothersome. This seat is also missing a window. 25 B None No Power Seat 25 B is a standard UK Domestic seat however, the proximity to the lavatory and galley may be bothersome. 9 A None No Power Seat 9 A is a standard UK Domestic seat that does not recline due to the exit behind. 9 B None No Power Seat 9 B is a standard UK Domestic seat that does not recline due to the exit behind. 9 C None No Power Seat 9 C is a standard UK Domestic seat that does not recline due to the exit behind. 9 D None No Power Seat 9 D is a standard UK Domestic seat that does not recline due to the exit behind. 9 E None No Power Seat 9 E is a standard UK Domestic seat that does not recline due to the exit behind. 9 F None No Power Seat 9 F is a standard UK Domestic seat that does not recline due to the exit behind. This A319 features a one class configuration with 143 standard UK Domestic seats. There are just two seats in this row but no window and no recline. No window - a blank wall on your left. Also no recline, but I expected that as it's a back-row seat. Standard seat, no air vents - In an already crowded plane, I would not recommend! The whole row does not have any fresh air vents. This is Business Class ?? My knees are in my face ! Why would anyone pay more for this than a coach seat ? I am flying on AA miles connecting from CDG to Heathrow then onto a AA 77W to JFK so I had no choice, but if I was paying money I wouldnt fly this airline. Front row seat was good for speedy boarding and disembarking. Extra legroom was welcome too, especially being allocated this seat at check in at no extra cost. 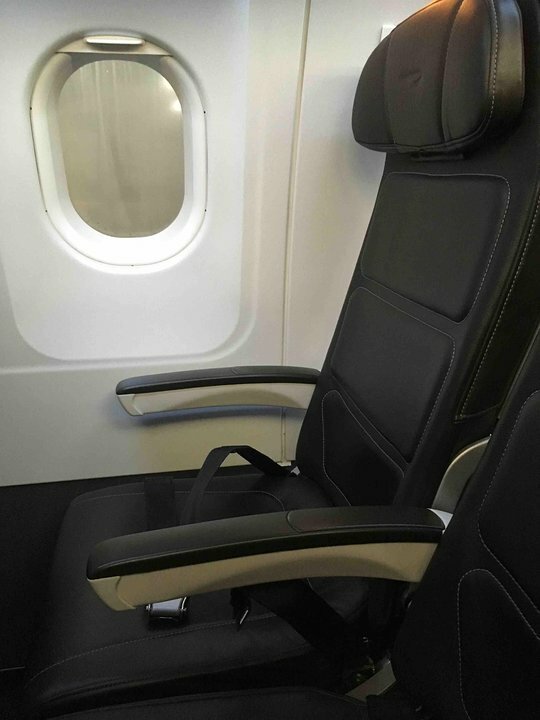 Comfortable leather seats, fine for a short flight. On board service is brief but again more than adequate for the duration. Plane was clean and comfortable. The flight to Edinburgh from London Gatwick was very nice the crew were very friendly. The pilot was good. Don't choose this seat to recline without bothering passengers behind you. One - there's no clearance for the seat to recline. Two - they actually removed the recline function from the seat (no button). The locker above these seats is often used for crew luggage too, and way too convenient for the lavatory.